I know I've joked before about my strange inability to separate Lord of Illusions and In The Mouth Of Madness in my head but, in all seriousness, I know that they are very different animals. As I sit down to write this post I have to ask myself: how does one set about deconstructing a Clive Barker movie? Ask the horror community to describe Barker and most will say he's a genius. In the late 80's, when his first novel hit the stands, it was a mystery story that embraced horror in the way Dante and Lovecraft would have admired but few other writers were really capable of. This really set the bar for his future stamp on the genre but, it also set the bar for his peers. By the time we were getting to sink our teeth into Lord of Illusions, we expected Barker to shake us to our cores - and he constantly delivered in that expectation. Clearly, he's a complicated man with a vast imagination and an extremely consistent history of butting heads in Hollywood. I think this clashing can make it hard to decipher what his true vision is VS what the MPAA forced him to commit to film. Who can really be surprised by any of this? The depth of his vision can easily be explored on paper but does not easily, or inexpensively, translate to film. Knowing that Barker is passionate about practical effects, I imagine this contention created some of the atrocious digital effects in Lord of Illusions. Although I'm also pretty sure there was no studio in Hollywood with enough money to properly use computers in 1995 (Johnny Mnemonic, Batman Forever, GoldenEye, need I go on?) because Pixar was hogging all the skill and or equipment. What a tangled web of sexuality and violence, lust and anger, death, religion, resurrection, vengeance, murder, magic, fantasy, and horror Barker has twisted together here. The plot? A magician and an intended human sacrifice escape from a cult (after killing the leader), only to find out later that he's not really dead - and now he's very angry. VERY, VERY ANGRY. They cross paths with a private detective who falls in love with the escaped sacrificial woman (surprise) and together they must battle the resurrected cult leader. Hmmm. I'm not sure that entirely covers it. You've got Scott Bakula, running around, battling magicians in something that could be a noir film if you stripped out the color and slowed down the pacing. Did I mention his terribly fake tattoo? Yeah, he's got one of those. We love him anyway because hey, he was on Quantum Leap! There's Daniel Von Bargen playing someone like Charles Manson crossed with Jesus who really wants to be one of Lovecraft's elder gods were he not so obsessed with Freddy Kruger-esue one-liners. Mix all of that up with a little 90's computer animation and you've got Lord of Illusions. I'm fairly certain that I've done a terrible job of selling this movie. I'm going to stop writing now, before I make things any worse. 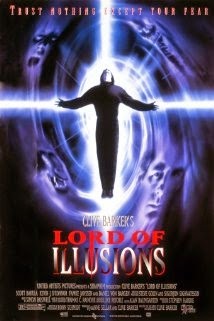 You should watch the Lord of Illusions trailer and let Clive sell his own work.